This JUGGERNAUT is not to be confused with the Richard Lester film of the same name that starred Richard Harris about bombs planted on a cruise liner. JUGGERNAUT 2017 is a very different Canadian nitty-gritty family crime drama that America churns out quite well. This one turns out pretty solid as well. JUGGERNAUT is the story of two brothers, one good and one bad. Sounds like a parable (Caine and Abel) from the Bible. Of course, good and bad are relative. The protagonist is the ‘bad’ one for the obvious reason that not only is the bad one a more interesting character but there is a chance for redemption as well. Saxon (Jack Kesy) has just been released from prison. Saxon is, as described in the film, a misanthrope (a person who dislikes and distrusts all human beings). He re-unites with his older brother, Dean (David Cubitt) in a small agricultural town in British Columbia. Dean is the town hero, bringing jobs to the town. Saxon learns from Dean that their mother has passed away while he was in prison, but he believes and goes out to prove that it was not suicide as stated in the death certificate. A few incidents are too predictable. The first girl Saxon meets happens to be Amelie (Amanda Crew). When Amelie confesses that she is Saxon’s brother’s fiancee, one can tell that thee is an affair that is just waiting to happen. There is a debate about bad person doing a good thing versus a good person doing a bad thing. It is too obvious that the audience is made to consider which one Saxon is. Not that it really matters to the plot. To enhance the film’s nitty-grittiness, DiMarko often shoots in dimly lit settings with moody period music and songs. Veteran actors Stephen McHattie (as bad guy Hank Sr.) and Peter McRobbie as the father also add to the atmosphere. The film has a side plot regarding Saxon’s estranged relationship with his father who favours Dean over him. Here, there are EAST OF EDEN overtones especially felt during the reconciliation (well, sort-of) scene. DiMarco paints a good character out of this chosen hero. Saxon is described as dumb but not stupid. Kesy, portrays Saxon with a rugged charm that eventually wins Amelie over. The story moves along at a good pace but suffers from an odd ending which at least is unpredictable. But he shoot-out ear the end is a bit of a cop out stretching the story’s credibility. 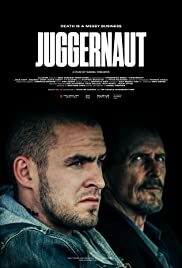 JUGGERNAUT is a satisfying small Canadian film that achieves what it set out to do, entertain with a story set in a grim atmosphere. The film opens this week with a VOD/Digital release on March 27, 2018. The film marked its world premiere at the Shanghai International Film Festival in 2017 as part of the Panorama program and was also screened at the San Diego International and Whistler Film Festivals.